Four Cambridge Branch members’ collections were open on Sunday July 7th and the weather promised to be sunny and very warm. Route planning was simple; head for Ely and then work back south-west via Great Shelford making a round trip of roughly 165 miles. Your Editor had sent his apologies owing to other family affairs; so I was assigned to record the event and weave these few words for the magazine. I do like the annual open days since they offer opportunities to snoop around other folks’ greenhouses, see their gardens, cross tracks with old friends as well as meeting new ones. Well this occasion did not disappoint with four very different C&S collections and many other plants and wildlife to appreciate as well as lots of chatter. Lynne and I started at noon at David Latham’s greenhouse in Ely. 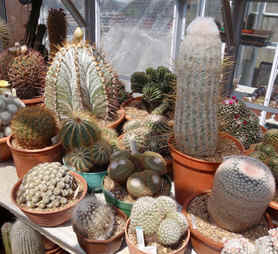 He grows a mixed collection of cacti and other succulents built up over thirty years. 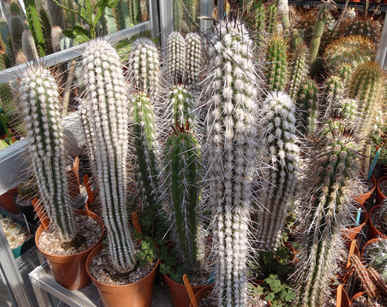 The main house is a 12' X 8' containing mostly cacti with some nice mature Astrophytums, Mammillarias, Rebutias, Echinocacti, Cerei and Thelocacti. 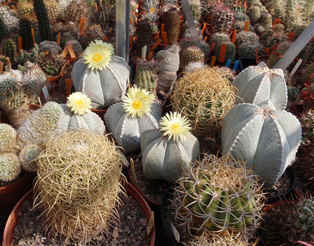 The older specimens are complemented by many seed-grown plants. 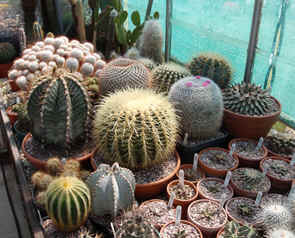 A second, smaller greenhouse is kept warmer to grow other succulents and more tender cacti such as Melocacti and some Cerei. 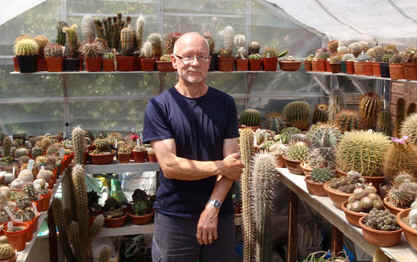 Above: David Latham in his greenhouse with his plants. There is also a developing collection of neater, smaller Agaves. 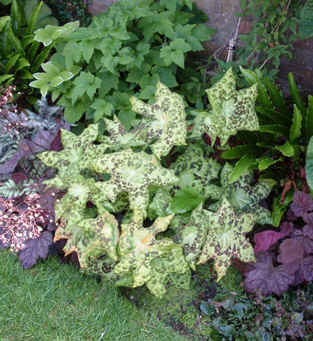 We also enjoyed seeing David’s garden, especially his “wet, shady, clayey border” with contrasting perennials including three variegated Brunnera cultivars, Primula vialii and the striking, rather well-named Podophyllum emodyi ‘Spotty Dotty’. Podophyllum emodyi ‘Spotty Dotty’. 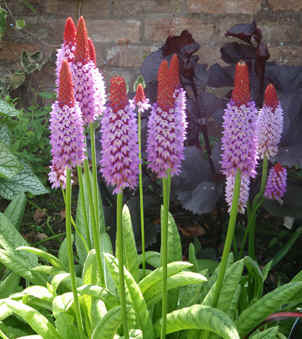 Primula vialii, an unusual looking species which likes a damp situation. 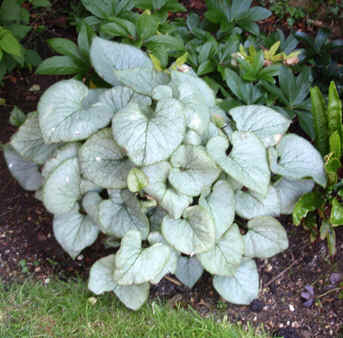 Brunnera ’Jack Frost’ It has small blue flowers in Spring rather similar to the Forget-me-not. We left David and headed twelve miles south to Cottenham to visit Trevor Jeeps. After some lunch in the welcome shade of his gazebo we were greeted by a sea of mesembs in the first section of a 24’ X 8’ greenhouse. 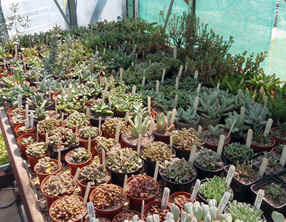 The other section featured nice Echeverias, Haworthias, Gasterias and some larger mature Cacti. Trevor has grown many of his plants from BCSS and MSG seed; and evidence of his success was obvious. We saw plants at various stages looking really healthy and there were many plants for sale. Yes, you guessed it: I found a nice Gibbaeum and a couple of Lithops to buy. 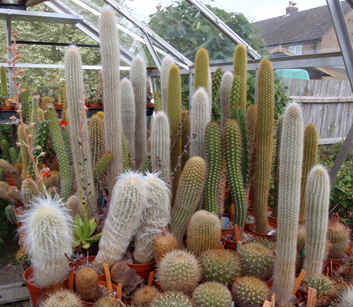 Left: Well grown cacti in Trevor Jeeps’ collection. 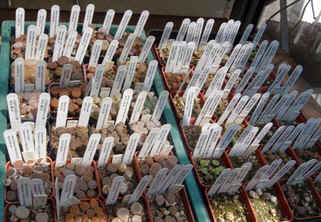 Right: A ‘sea of Mesembs’ and Lithops seedlings as part of Trevor Jeep’s collection. Our third venue was a few miles further south in Milton on the outskirts of Cambridge, where we met Tina and Hugh outside; they were travelling in the opposite direction. 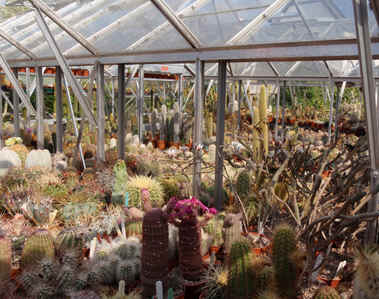 Clarke Brunt has mainly cacti in a 20’ X 8’ greenhouse. He focuses his efforts on propagation and seed raising rather than growing large specimen plants. 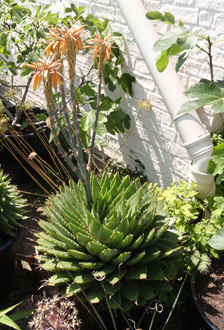 There are also some other succulents, notably a selection of Aloe polyphylla plants ranging from 10cm to 50cm pots, one of the largest being in flower. 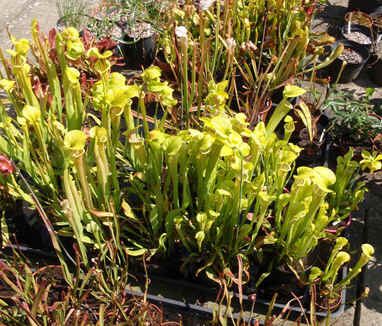 Clarke’s garden featured a pond, beehive, carnivorous plants, bulbs and many containers. We also viewed the swift’s nest (in one of the six nest-boxes) via the camera and monitor. Fortunately I had taken a box and packing with me; a Scadoxus (South African bulb) and a Bromeliad from collected seed joined the three small mesembs to travel back to Towcester. 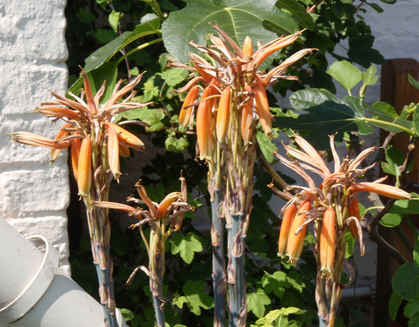 Above and right: Aloe polyphylla, a flowering plant in Clark Brunt’s collection. Our final stop was with Paul Hoxey in Great Shelford. 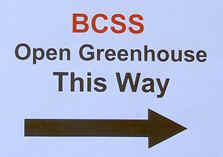 Paul has been growing cacti since the 1980s and recently celebrated 25 years of BCSS membership. He has three greenhouses cleverly amalgamated into one structure, which is filled with cacti with a few other succulents, cycads and bromeliads. Paul uses very little heat in winter, keeping a small ‘inner sanctum’ warmer for selected Cerei, and the majority of his very large collection stay dry and just frost-free. Above: A general view in Paul Hoxey’s collection. Paul’s collection is split evenly between North and South American species and is dominated by plants raised from seed collected in Chile, Peru and Mexico during the past twenty years. He is removing undocumented plants and the result is a sea of orange labels denoting his own collected seed-grown material. I have never seen so many Eulychnias in one place! Astrophytum myriostigma flower in Paul’s collection. 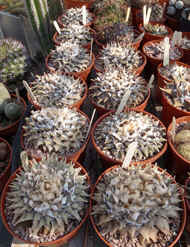 Paul’s superb seed raised Ariocarpus. Ed: Thanks Roland, I always enjoy a good travelogue around cactus and succulent country, even when they are Cambridgeshire cultivated. Sounds like a great day and it is just unfortunate that family celebrations prevented my attendance. Open days are definitely one of my favourite ways of spending a day (and acquiring some more plants and cuttings) and we should be grateful that growers are prepared to make the effort.